Daisen G Weihen Hop is a 6% wheat ale from Kumezakura Shuzo, based in Tottori, Japan. It’s part of their autumn lineup of craft beer and can be found in both bottles and on tap across Japan. Daisen G Weihen Hop is brewed using locally sourced hops from Oyama every summer before being dried and then used in the beer. The word “weihen” is German for “consecrate” or “affection”, perhaps referring to the hops they use in the beer every year. Unlike the Daisen G Gold, it’s unknown if Daisen G Weihen Hop also uses locally sourced malt. Interesting choice to make a hoppy wheat ale. 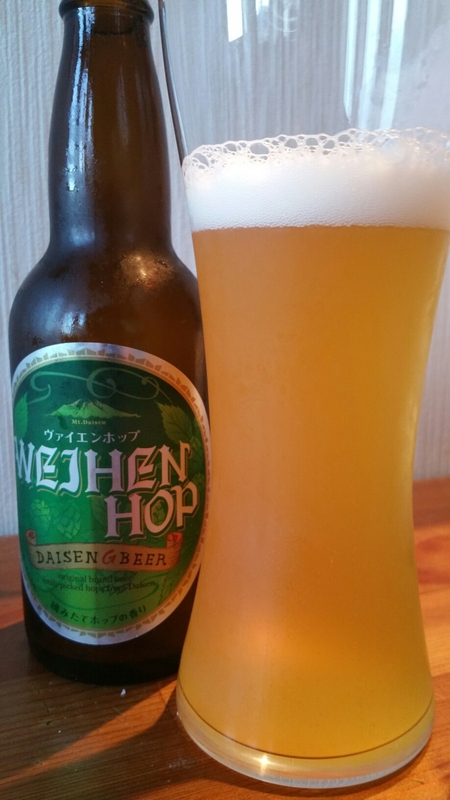 Daisen G Weihen Hop poured out a hazy light straw colour without much head on top. I thought it was hefeweizen-like beer, so tried to use the wheat glass to get some life, but alas, no. The only head I got was in the picture above, and that quickly went away to leave just a few bubbles around the side of the glass. It had a sweet banana aroma with hints of grapefruit, from the hops I guess, along with a distinct wheat biscuit aroma following soon after. There was also as slight peppery edge to Daisen G Weihen Hop once it had warmed up. There were more fruity flavours to follow in the body with Daisen G Weihen Hop with passion fruit, lychee, and lemon coming through – aromas not normally associated with wheat ales. With so much fruitiness going on, the wheat biscuit flavour had some problems trying to cut through everything, though it did. Just. The body was quite thin and light, and would have been refreshing in the hot Tottori summer sun – a shame it was released towards the end of autumn though. Daisen G Weihen Hop brought something new to wheat ales with its fruity playfulness – a shame it’s released when the weather is getting cool though.